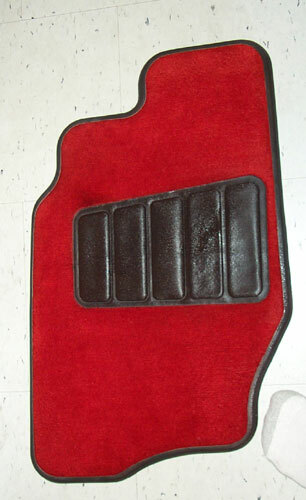 This is the step by step procedure for bleaching and dying the charcoal floor mats in a 3rd gen j-body. 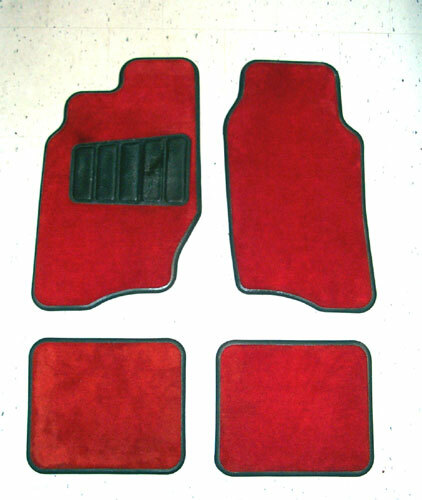 That said, the same procedure should apply to any other floor mats out there, though the results may vary depending on what they're made of. Warning: I've found that the dyed mats don't wear all that well when left in the car. They look amazing for shows but after a few weeks of driving around with them, they end up looking faded and dirty. Obviously dirt shows up more on a brighter colour than on tan or black. Results may vary depending on the type of dye you use so I recommend doing this only when you have another set of mats for everyday driving. I recommend the WeatherTech brand, which is what I use in my car. First I went out and bought a Rubbermaid bin that was big enough to lay the front mats flat in. You could do the whole thing in your bathtub but you'll likely need more dye since there will be a lot more water and you'll have to find somewhere else to bathe for a few days while the mats are being bleached. I then tossed all the mats into the bin and filled it with hot water from the tap until the mats were completely submerged. I took them out and added a bunch of bleach. I don't know how much is "needed" but I just dumped a whole bunch in. I then ran hot water over the mats to ensure they were completely soaked and then dropped them into the bin. I stirred up the mix for about 5 minutes so that the bleach could work its way into the mats and then left them. For 3 days. Every few hours, when I was around, I'd stir it up a bit and a few times I pulled out the bottom mat and put it on top. I'm not sure if that affected anything, but it seemed like a good idea. After the 3 days, I dumped the whole bin out in the bath tub and thoroughly rinsed the mats. If you don't find them light enough, you can repeat that process but as you rinse them you'll notice that they're now a lot lighter than they looked in the tub and all the rubber around the edges and on the back looks like absolute hell. Don't worry about that. It will be taken care of later. Once they were completely rinsed out (take your time, you don't want any lingering bleach in them when you dye), I rinsed the bin really well and filled it again with hot water. I kept the bin in the bath tub this time and again put the mats in so I'd know when I had enough water. You want them fully covered with enough water that they don't pop out when you're stirring, but you don't want the bin completely full since you want the dye to be as strong as possible. I then removed the mats and added the dye. I used a brand called Tintex that I just happened to come across at a Home Hardware store in a mall. I don't know anything about fabric dyes but this stuff was cheap and it started off as just an experiment so it seemed as good as any. Every 5 minutes or so, I'd pull out the bottom mat (or mats, if it was the back 2) and placed them on top. I wanted to make sure everything was dyed equally. It might not have made a difference, but that's what I did. When you're done, you can dump out the bin (now you get to wash the bathtub too!) and rinse the mats in cold water. Having a hand-held shower head really helped here. If the weather's nice, you might want to use the hose if you can get them outside without dripping red dye everywhere. :) Keep rinsing them until the water runs clear. It will take a while, but you don't want to leave some dye in the mats where it'll get on your shoes and stuff later. Now leave them to dry. They'll get a fair bit lighter as they dry so if they end up too light, you can always repeat the dying process. I didn't have to. Note: You may have to dye the mats two or more times before you get the results you want. Mine faded dramatically after a week or two but then, after the second dying, they held the colour well. Don't be discouraged if they're not vibrant enough after the first dip.